Preliminary Sketch of Cape Charles and Vicinity. A rare hand colored 1853 coastal chart Cape Charles, Virginia. Cape Charles forms the southeastern tip of the peninsula formed by the Chesapeake Bay. At one time it was an important stop on the railroad and still serves as a ferry base for crossing the bay. In addition the romantic scenic location has become a popular summer tourist destination. Also depicted are Smith's Island, The Isaacs, and Fisherman's Island. 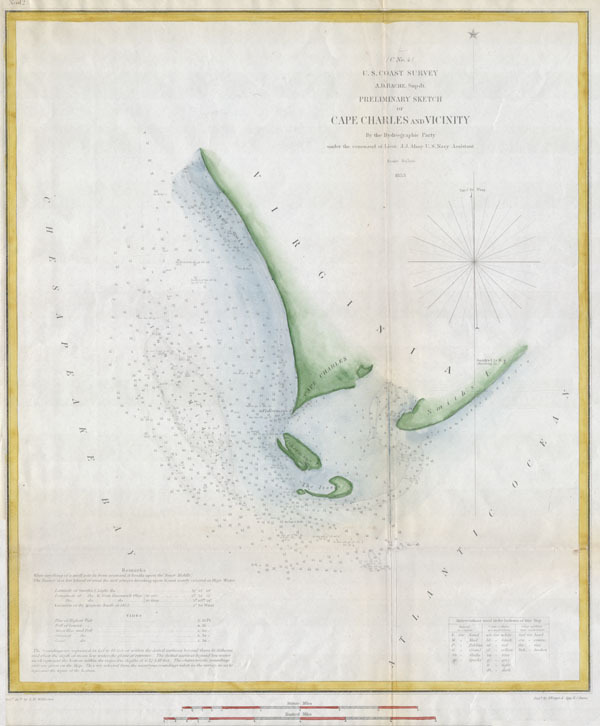 Includes detailed depth soundings, the location of a light house, and sailing instructions. Published under the supervision of A. D. Bache for the 1853 Report of the Superintendant of the U.S. Coast Survey.